Here's my card for the current My Favorite Things Wednesday Sketch Challenge. This one came together quickly with some pretty patterned paper and a few of MFT's Die-namics dies. Even though I think they're really pretty, I rarely end up using the larger scale floral prints in patterned paper pads. This design was perfect for showing one off! I used the floral paper to cover a white card base, then topped the card base with a coordinating pale pink pierced circle die cut. For the layout's angled strip, I die cut the word "friend" from both berry cardstock and craft foam. After layering the two pieces, I adhered them to the cardfront on an angle. 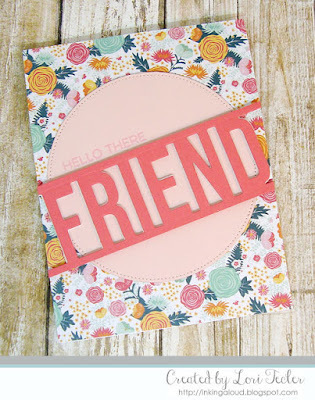 The "hello there" sentiment from the More Essential Sentiments stamp set was stamped just above the die cut word in pink ink to finish the design.